It’s fear season again. Halloween is just a few days away, as you know, but I am not talking about All Hallows’ Eve. It’s an election year. Over the past few weeks, you may have heard a lot of stuff in the news about the latest worldwide panic. This time it was Ebola. Don’t get me wrong, it’s a serious disease with a 50% mortality rate, but, so far, more people have been married to Christie Brinkley than have contracted Ebola in the United States. However, if you listened to CNN and the other fearmongers among us, you probably thought it was time to don the hazmat suits and crawl down into the bunker you built in your backyard to wait it out. You did build your bunker during the last crisis, right? What was it Y2K? Mayans? Zombies? I’ve always liked that quote. The language is a bit archaic, especially in the internet age when so many people don’t know the difference between “you’re” and “your” and far too many people think “alot” is a word. I digress. 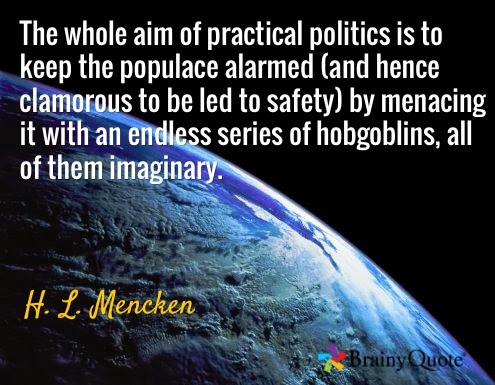 Menken is saying politicians will play on your fears even if they have to create the monster under your bed to do so. When you are afraid, you are easily manipulated. Over the last couple of weeks, people on one side of the aisle have blamed the President for Ebola while the President and his defenders have blamed the other side and budget cuts for Ebola. Neither side is right, of course, but that doesn’t matter in an election year. They need your votes and they need your money. Do you know what really causes Ebola? Ebola! In a few weeks, we will have midterm elections. Between now and then, you are going to see a lot of fear, bitterness, and hatred on television. Ignore it. Do not vote for anyone out of fear. Scripture says we are to respect our leaders. That’s hard to do these days. The best and brightest just don’t seek office anymore. I can’t say I blame them. Look what we do to them. Look how they treat each other. In return for saving us from each imaginary crisis, we trade away a little bit of freedom, a little bit of dignity. P.J. O’Rourke calls government a parliament of whores—and we’re the whores. Scripture also has a bit to say about fear. It’s not a new thing, but God did not give you a spirit of fear. That spirit comes from the other guy. There will be other panics—other hobgoblins—real and imagined. You’re role is to be in the world, not of it. Before you retreat to the bunker, or your church, to hide from the world around you, remember who has authority in you life. Big night of election returns last night, no matter which side you are on.